Kate is a landscape designer who created her own business after graduating from the Conway School. She specialized in ecological landscape design for residential clients and large-scale landscapes. Prior to teaching at Conway, Kate served as a visiting critic and presenter, and consulted with the school by reviewing and editing reports. Kate has experience teaching in an undergraduate architecture studio and as a reader for a landscape studies course. 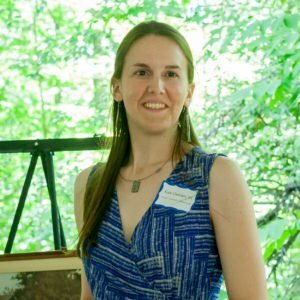 Prior to Conway, Kate was a project designer in green infrastructure planning at Nitsch Engineering in Boston, where she contributed to master plans for college campuses, design competitions, and permitting applications for large-scale development projects, among other projects. After a summer fellowship at the Cultural Landscape Foundation in Washington, DC, Kate began working at Conway in August 2015. A common thread underlying Kate’s professional work is developing a design process emphasizing thorough analysis of cultural, physical, and temporal aspects of a site. This thread guided her work as a sole practitioner and, later, part of a large engineering firm. With a multidisciplinary background, Kate brings strong skills in ecological landscape design, green infrastructure and stormwater planning, digital and hand graphics, cultural landscape research, and report writing. She encourages students to gain both concrete skills and knowledge on a wide range of aspects pertaining to design and planning. Kate is a faculty member and admissions coordinator.